Everything in life is better with “and” in the title; peanut butter and jelly, cookies and cream, and cooler and portable air conditioner to name a few. 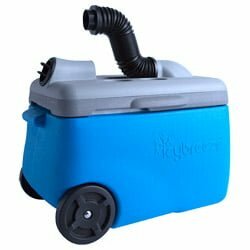 To see if the IcyBreeze measures up to the high “and” standard, I put it through my research paces to create the IcyBreeze cooler review. Follow along to learn what this cooler and A/C combo is capable of, and how it performs in real life. Put that lazy ice just sitting around in your cooler to work. The chilled temperatures produced and maintained by the ice cubes or the ice packs, and the insulation of your cooler, have so much more potential. IcyBreeze has harnessed that potential by directing the ambient cold air from the inside of the cooler to your warm face. 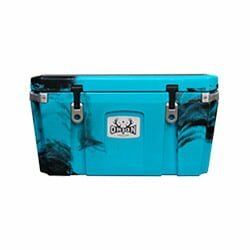 This cooler is an amazing companion to carry with you on those smothering, hot days. Turn a sweaty summer picnic into a perfect temperature day at the park. 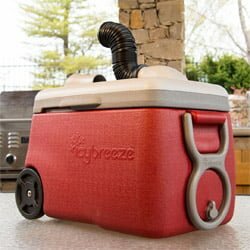 By adding water to the IcyBreeze Cooler, this ice chest transforms into a portable air conditioner. The 2-quarts of water that you add to the IcyBreeze chill to temperatures just above freezing. That water is then pumped up through a radiator that draws air with a fan. 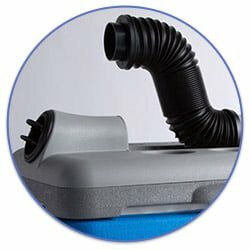 In the end, that comfortable, soothing air is blow out to you through either a vent or a flexible hose that lets you direct the air wherever you want. The air produced can be blown at a stunning 25 miles per hour. The results of your IcyBreeze portable air conditioner and cooler is your cool wind that can create temperatures up to 35-degrees colder than the surrounding air. While the other parents are dying of heat during the kids’ little league game, you will be sitting comfortably. 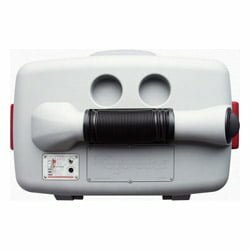 If you are feeling charitable, the IcyBreeze can blow out air to a group of parents on the sideline. 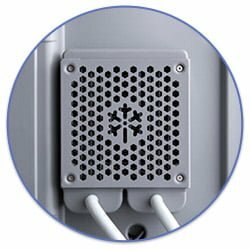 The IcyBreeze Cooler uses power from a 110-volt wall plug, a 12-volt adapter that can be plugged into your car’s cigarette lighter, or an optional rechargeable battery that lets you cool on the go when a plug isn’t available. The battery option had a charge of 2.5 to 6 hours depending on the fan speed setting you select. We guess that the actual way to introduce the IcyBreeze is that the cooler is the primary function. The cooling power of the IcyBreeze comes from the thick insulation of the cooler that has nearly 5-inches of insulation. The amount of insulation packed into the IcyBreeze cooler makes it capable of ice retention for up to 7-days in outside temperatures up to 90-degrees Fahrenheit. 5-inches of insulation is a lot of cooling power, but the cooler still maintains a respective 38-quarts of interior space. 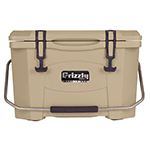 That 38-quart capacity translates into the ability of the IcyBreeze to hold 30 pounds of ice, 49 12-ounce cans, or a combination of both. Strong and durable polyethylene plastic comprises the build of the IcyBreeze body. 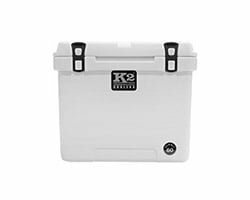 The rugged build protects both your chilly yummies and the vital components that make this cooler the wonderful combination of cooler and portable air conditioner. The same polyethylene compound is used to make many of the items you use every day; the most impressive is bulletproof vests. That’s right; this cooler is the same stuff that stops bullets. We don’t recommend shooting it, though, you’ll void the warranty and lose out on your air conditioning. 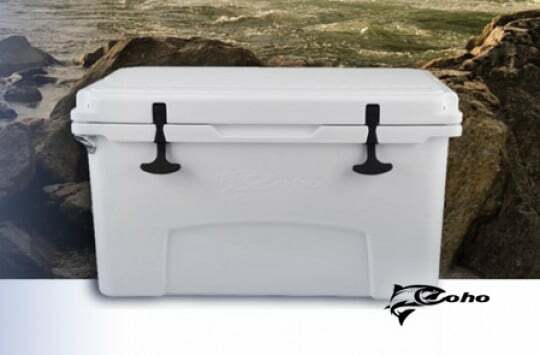 By using a lightweight yet strong plastic in the construction of the cooler, IcyBreeze has limited the weight of the cooler to just 16-pounds when empty. The lightweight makes it easy to transport and pack. Even when loaded down with ice, food, and drink you are looking at less than 50-pounds. Dual lift handles, one on each end of the cooler, make it easy for two people to lift and transport the cooler. The molded handles attach to the body of the IcyBreeze, so you don’t have to worry about them shifting or breaking. 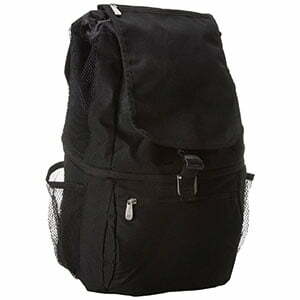 The only problem with this design is that they are small and can be tough to walk while carrying. IcyBreeze has this covered thanks to the pair of large wheels on one end and a long pull handle on the other. Between the two, you can tug the cooler along across the most of the terrain you will find yourself enjoying. Deep sand and mud may pose a bit of a challenge for you to trek across, but you’ll make it with a little effort, plus you’ll have a nice A/C to cool you down after the trip. 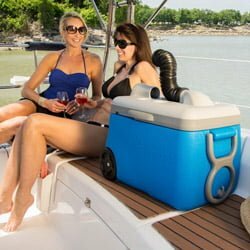 If the amazing ice retention and cold air of the IcyBreeze portable air conditioner and cooler aren’t good enough for you to take the cooler out on your next trip to the park, it also has two cup holders built into the lid. 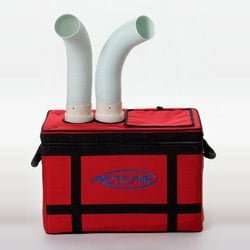 If you angle the flex hose correctly, you can run the cool air over your drinks to keep them chilled while you enjoy the summer sun. 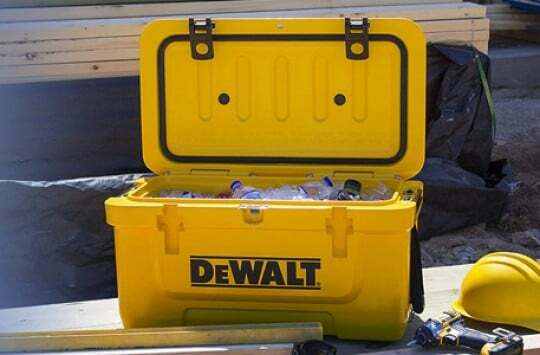 Once the party is over, the cooler is just as easy to clean and store. At the base of the cooler, on the same side as the pull handle, is a drain plug that pops the water out of the cooler in a matter of minutes. Once the cooler is empty, a quick wipe down will have the IcyBreeze cooler prepped for your next adventure. The IcyBreeze has tremendous A/C capability, and we thought that it wouldn’t do an IcyBreeze cooler review justice if we didn’t offer you a little comparison with a portable cooler that has proven results. For today’s challenge, we present the ArticAir. The ArcticAir is a portable A/C that was designed to fit in the tight cabins of an airplane, and use only water, ice, and air to provide cooling in the limited space of your typical personal jet. The Arctic Air may find primary use in planes, but it has the power and flexibility to use as a personal cooler just about anywhere. 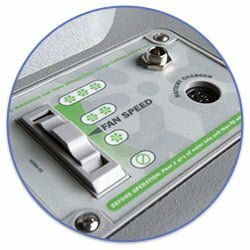 The ArcticAir has two model options that allow you to choose between a single air outlet or a dual air outlet that lets you cover more area with that refreshing spray of cold. Both tubes are flexible and directable in whichever direction you want, letting you spread the cool air around to everyone in your group. IcyBreeze conducted their a head to head test to determine which of the two performed better in a series of tests. I usually don’t give a lot of attention when a company provides proprietary test results, but some of the info shines a good light on the differences between the two coolers. According to the test, IcyBreeze set up both coolers with 30 pounds of ice in a 90-degree environment for 2.5 hours. The result was a higher performance by the IcyBreeze over the 2.5-hour trial. Their ice lasted 3 times longer and had an average temperature that was 7 degrees cooler than the ArticAir. What intrigued me more about the test report was the lineup of key features. Based on features alone, the win is overwhelmingly in IcyBreeze’s favor. 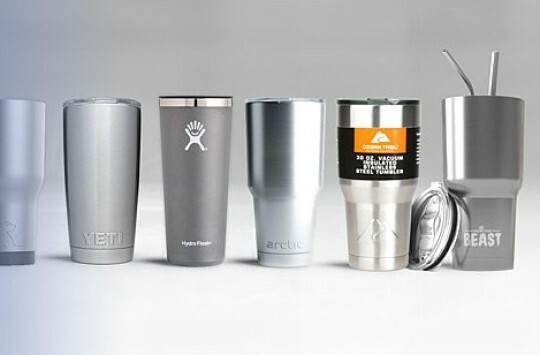 The ArcticAir works well to keep your area cool, especially if you are planning on using it to keep you cool in a car. The biggest drawback as a cooler is that it only has a 12v power connection. In contrast, the IcyBreeze has a 12v car adapter, 110v wall outlet, and rechargeable battery power options making it flexible for almost any place or activity. In addition to the power, the IcyBreeze can carry food and drink and uses more durable build materials. Even with the higher number of features in the IcyBreeze, and its overall higher degree of flexibility, both portable A/C units are an excellent choice. While the IcyBreeze wins according to our research, it is up to you to decide which will better fulfill your needs. Just like choosing your new cooler, you have the choice of where you want to buy it. In our experience of scouring the internet, researching products and their sellers, and being slightly addicted to online shopping We have found that Amazon.com is among the top sources. We like recommending Amazon as it offers great buyer protections. Even though you can buy directly from the manufacturer in a lot of cases, Amazon offers faster shipping (even free if you are a Prime member), and hassle-free returns without restocking fees. IcyBreeze Portable AC Cooler – Plug in the Cool! 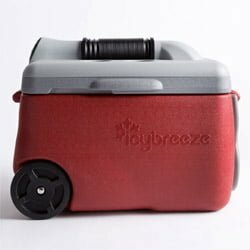 After a fun-filled journey through the ins and outs of creating the IcyBreeze Portable Air Conditioner and Cooler review, we must admit that we love the multifunctional ability that IcyBreeze offers. We’re the types that love to have a cake and eat it too and being able to have our favorite drinks kept cold, while simultaneously making the summer heat more bearable, quickly sends the IcyBreeze Cooler to the top of our favorite gadgets list. The multiple power sources add amazing flexibility that can let your transport the IcyBreeze anywhere you will choose to adventure. 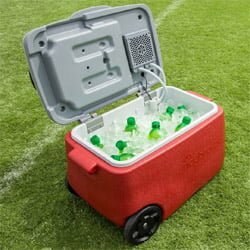 It’s true that we have seen coolers with better ice retention, higher capacity, and even alligator proof certifications, but none of them have a built-in A/C to top the whole game off. I am the type that loves to have my cake and eat it too and being able to have my favorite drinks kept cold, while simultaneously making the summer heat more bearable, quickly sends the IcyBreeze Cooler to the top of my favorite gadgets list.